Same functionality as 3P Volume Filter VF1. 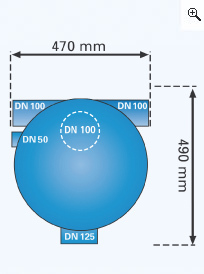 Connection capacity according to DIN 1986 for roof areas up to 350 m². Max. 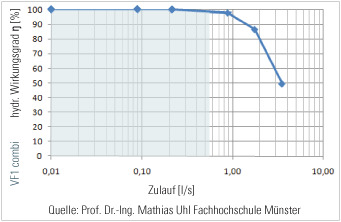 Flow Rate Sieve insert 1,5 l/sec = 5,4 m³ cleaned water per hour. Height difference between inlet and outlet 300 mm. The filter has to be cleaned depending on the contamination 1 - 2 times during the year. 1. As water arrives the level builds up and is equally distributed across the cascade. 3. Pre filtered water then flows over the secondary filter sieve (mesh size 0,65 mm). 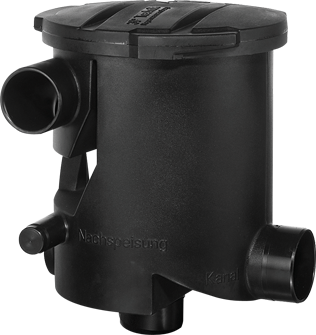 Due to the special mesh structure of the sieve, any dirt washes directly into the sewer which means the filter is self cleaning, with very low maintenance. 4. 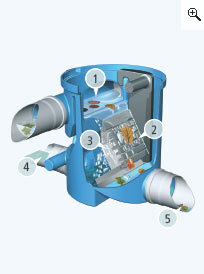 Cleaned water flows to the cistern through the outlet at the bottom of the filter. 5. Dirt goes to the sewer. 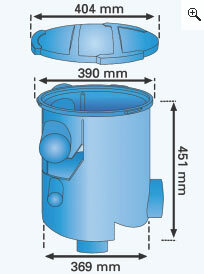 Height difference between rainwater inlet and outlet 300 mm. 3P Volume Filter VF1 combi installed inside a shaft of a plastic tank. Special installation with Overflow Siphon Mono.